IPC Athletics, the global governing body of para-athletics, has launched its Education Pathways Programme which aims to improve the standards of classifiers, technical officials and coaches within the sport. 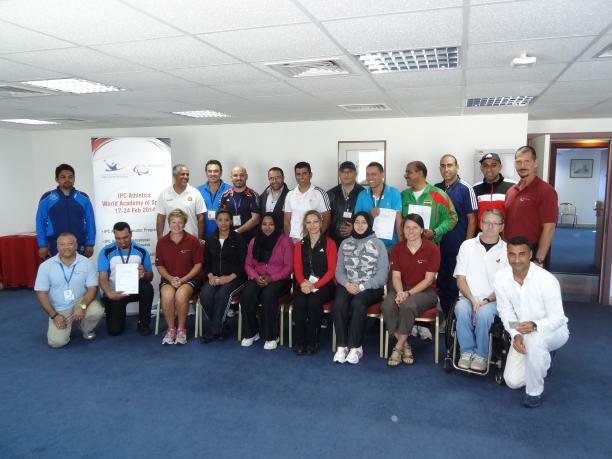 Produced in conjunction with the IPC Academy, the IPC's education arm, the programme is targeted at National Paralympic Committees (NPCs) and provides a learning pathway for each technical area. The pathways start from the initial entry point into the sport at club level, right through to the international stage and the Paralympic Games. The programmes and learning pathways - which are available at www.ipc-athletics.org/education - have been established to provide a ready-made resource and structures to assist NPCs develop the sport of para-athletics locally. Using the programmes, NPCs can then engage with the learning pathways, adopt them to their development plans and deliver programmes locally. This will allow them to accredit people and provide opportunities for individuals to be involved in the delivery of para-athletics on a local and national level. Ryan Montgomery, Head of IPC Athletics, said: "Para-athletics is growing faster than ever before and therefore it is vital that as the number of participants continues to increase, so do the number and standards of those who undertake key roles that are essential to the development of the sport - namely the classifiers, technical officials and coaches. "We are extremely pleased that these comprehensive education programmes include a mixture of face-to-face education courses in multiple languages and online learning, and hope they will support the development of the para-athletics community globally." Chris Solly, IPC Academy Director, said: "It is exciting that we are at a point where these pathways are now being consolidated. There have been a number of programmes developed over the past few years and many countries have already benefitted from such programmes. "Having a combination of online programmes to provide the explicit knowledge and a comprehensive certification process for face-to-face programmes creates the framework that we set out to achieve for IPC Athletics. The IPC Academy and the World Academy of Sport is proud to be able to empower a global workforce by implementing these methodologies and working alongside IPC Athletics and its technical experts throughout the development and roll out of these programmes." The IPC Academy is a partnership between the IPC and the World Academy of Sport. Full details of all IPC Athletics' education programmes can be found at the Education section of the IPC Athletics website.